6 species) with the botanical name Saintpaulia. These plants are native to Africa and found primarily in Kenya and Tanzania. If you’ve had success with growing orchids you may want to try growing African violets because their needs are not too significantly different. African violets are compact growers so if you are worried about the space it might take up, the plants will only reach 2 to 6 inches tall and 3 to 16 inches wide, which makes them ideal for growers with small spaces. African violets grow either as “rosettes” or as “trailers.” Rosette growers form a circular leaf arrangement, and trailing plants grow sideways and spread out over a larger area. The blooms of Africa violets come in a few different colors, including purple, violet, white, pink, and fuchsia. Some of the blooms are solid in color and others can be bi-colored and have a contrasting color along the edge of the flower. The leaves are round or oval in shape and are thick and consist of a hairy texture. Healthy foliage will be a dark green color. It is important that when you water your African violets that you do not get water in the crown of the plant or on the leaves because this could cause disease and rot to set in. 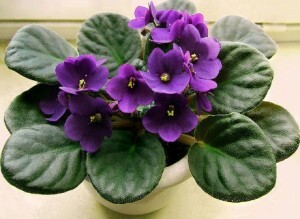 Many African violet growers recommend placing the plant’s pot directly into a bowl of water and letting the plant absorb the water from the roots to ensure that water doesn’t get on the foliage. If you would rather water from the top you can just be extra careful and place the water spout directly in the potting medium. African violets like to be evenly moist but never soggy. You’ll need to water more frequently in the hot summer months and less frequently in winter. It is recommended to use tepid water, because cold water can shock the plant’s roots. African violets require bright, but mostly indirect, light intensity. They can handle a little indirect light, in the early part of the day, although midday sun is too much for them to handle and direct sunlight during these hours could cause sunburn. If your plant is not getting enough light, the leaves will turn yellow in color and the leaves and stems may begin to elongate. Lack of light may also keep your plant from producing flowers. If you are growing your African violet indoors, an ideal place would be in a windowsill that is facing west or a southern windowsill as long as you provide a sheer curtain for protection from the intense midday sun. African violets thrive in intermediate to warm temperatures. The temperature requirements are daytime temperatures somewhere between 70°F to 80°F (21.1°C to 26.7°C) and night temperatures shouldn’t drop below 60°F (15.6°C). If your African violet experiences extended periods of cooler temperatures below the recommended range, this could cause the plant to become more susceptible to rot and disease, slow down its growth, and prevent it from flowering in the future. African violets thrive in fairly humid conditions. A relative humidity level that is ideal for African violets is somewhere in the 50-60% range. If an African violet is kept in a growing environment that is too dry, this could cause the leaves to shrivel and the flowers won’t open. If you need to increase the humidity for your plant, you can place a humidifier nearby or simply grouping African violets together can increase the humidity level. Just as with orchids, African violets require good air circulation when they have high humidity levels. Proper air circulation helps to prevent rot and disease from setting in. If you set a fan nearby to help with air circulation, make sure that the air doesn’t blow directly on the plant because this may cause the plant to become too cold. You will want to purchase a fertilizer that is specifically made for African violets and fertilize based on the instructions printed on the label. Fertilizer buildup can damage the roots and leaves so it is important to flush out the excess fertilizers every few months with plain water. The potting “soil” specifically for African violets is not actually soil, but usually a mixture of sphagnum peat moss, perlite, and vermiculite which makes for a light, porous mix that also has good water retaining capabilities. You will want to repot your African violet in a pot not much larger than the width of the mass of roots. Most of these plants do well in a 4-inch size pot.